The following police services asked to come: Avon & Somerset, Cumbria, Cambridgeshire, Dorset, Gloucestershire, Greater Manchester, Hampshire, Merseyside, Metropolitan, Norfolk, North Yorkshire, South Yorkshire, Staffordshire, Suffolk, Surrey, Sussex, South Wales, Thames Valley, Warwickshire, West Midlands, West Yorkshire, Police Scotland. PS Northern Ireland. Also attending were Leicester University Law Department (who are carrying out research on harm reduction traffic policing); Madison (importers of Cycliq camera lights) and Cycling UK who have distributed mats with passing distances for educational sessions. A representative of the College of Policing attended. 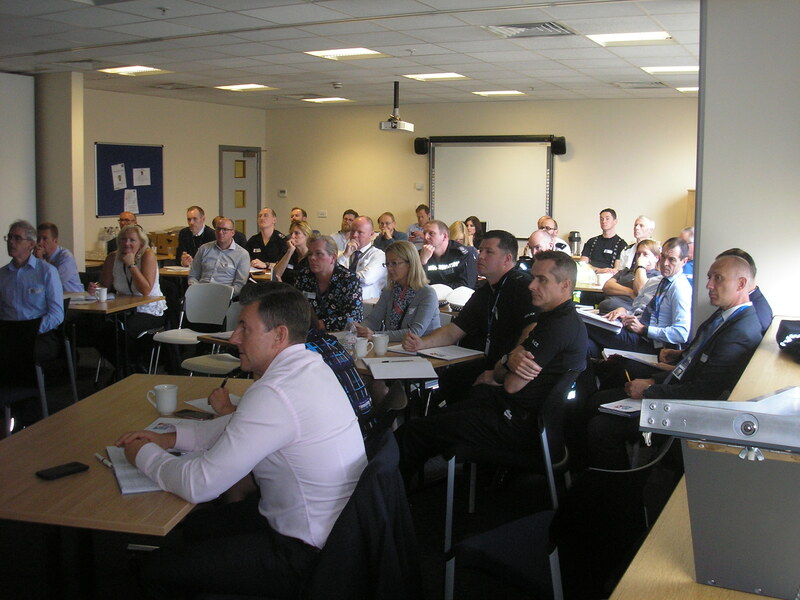 There will now be a specific mention in the curriculum in the roads policing module of close passing, although for close passing policing to be carried out on a national basis there will have to be commitment from the National Police Council after representations from Chief Constables. Below is what we hope is a reasonable accurate summary of where Police Services (PSs) are as of mid-November 2017. I have added some comments that have appeared in the press. Please note that since PSs are not obliged to inform us of the current situation the reports below may be inaccurate or out of date: this is a rapidly changing scenario. Do contact me about inaccuracies! 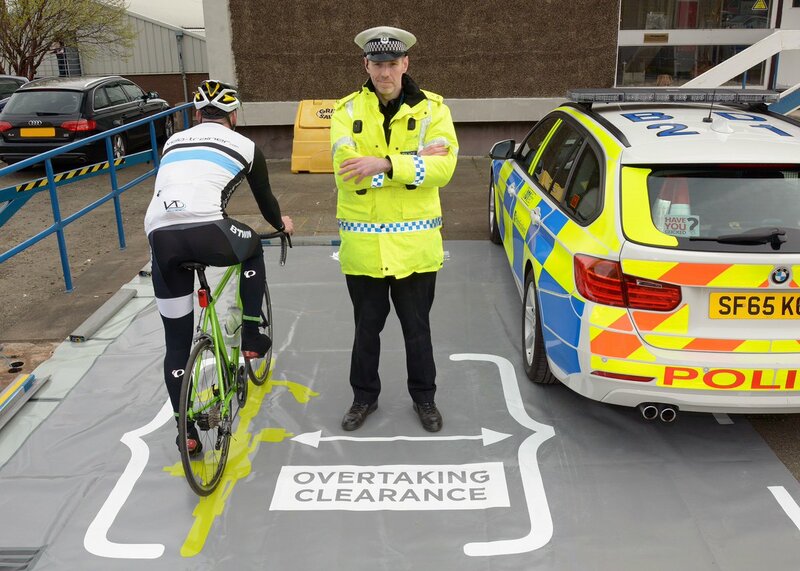 They have a Cycling UK mat and had done full close pass operations 3 times in Bristol, and also in Bath, Swindon & Cheltenham by mid-September. Lots of publicity success, with 10% engagement on social media – 2.5% is more normal. Local BBC news covered an operation as a main story. They were due to run more operations. 3rd Party: They started automated online reporting of traffic incidents in September, and can use info from this to promote the close passing scheme. Use of 3rd party footage for prosecution is now allowed. Avon and Somerset give cameras to officers who commute by bike. 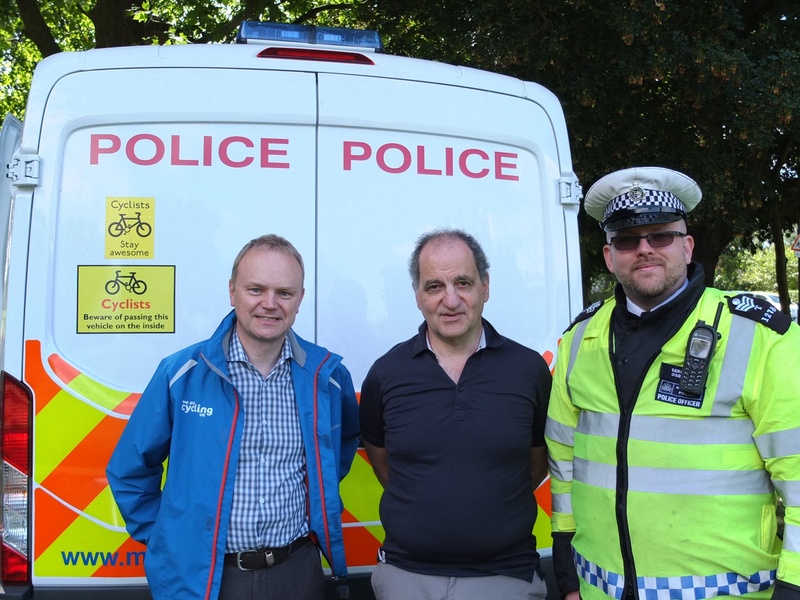 “…despite the content of some media articles, I am currently still liaising with West Midlands and other police colleagues regarding this cycling safety initiative and how it could be adopted within Cambridgeshire. It is unfortunate that the recent report may have left you feeling that we had completely discounted it. I can assure you that this is not the case,… I hope you feel some reassurance that we are still reviewing the matter….” We understand that there is fresh interest in a programme being started. Close passing work in infancy. Using mat for education only, promoted on social media. Some 3rd party reporting is done; they will try to add close passing to this. Initial interest has been shown. They have mats, and had done one close passing operation in each county by mid-September. They have been doing education at events, especially for cyclists, and for refuse truck drivers. They have used social media, generating lots of conversation. They hope to involve the fire service, and consider 3rd party online report submission. They have written a cycling code of conduct, and run a road respect campaign for all users. 3rd party: They will now be insisting that any footage place on a public or shared YouTube feed will receive no further police action beyond a warning letter. They will have a dedicated website running soon and until then, a dedicated email address exists with a few ‘file transfer’ options to assist the current process. A partnership meeting set for Nov 24th to discuss fully embedding the scheme into their road safety strategy. Working with other local forces. The Cheltenham operation involved 10 officers (5 of them specials), plus a press officer and the press. The high number of officers was just for the first operation, partly to train them. There were two police cyclists and a motorcyclist. The operation was similar to the West Midlands one. No-one was reported for prosecution. There was a range of reactions to education with the mat. They found a visual aid important, the figure of 1.5m less so. One driver was interviewed by the press, and there was also social media reporting. They use a leaflet prepared by Gloucestershire CC which is included in our information pack. They didn’t have 3rd party incident reporting in mid-September. A number of pilots had been undertaken earlier this year. 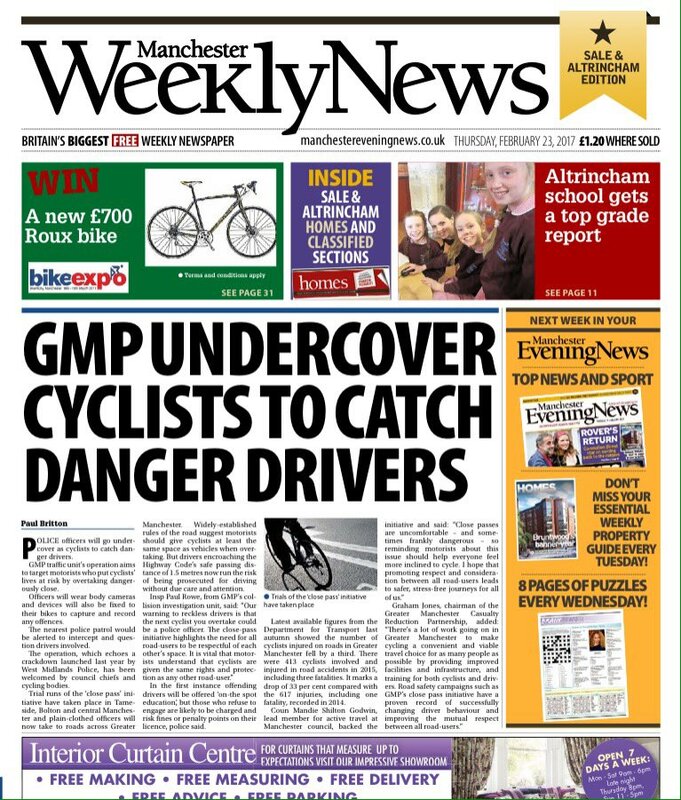 GMP use a special police officer number to identify 3rd party reports. They ran pilot schemes in the Autumn. Their close passing operation was preceded the day before by talking to cyclists about safe cycling, including contrasting colour, hi-vis, and free lights. By mid-September there had been 6 close passing operations in Hampshire, one of which was filmed (and is well worth watching) by BBC Inside Out, and one in Thames Valley. There has also been a back of bus campaign, and leaflets. They use 3-4 officers plus a council RSO and someone from the fire service for each operation.They had no 3rd party reporting mechanism except for dangerous driving in mid-September, but want to set one up. They are using VR (virtual reality) goggles for training. (A road.cc report emphasises disproportionate numbers of different road users stopped). A team was created 12 months ago. Operation “Safe pass” started on 2 July, with 6 operations up to mid-September. Emphasis has been on education and engagement. They have done around 120 stops in their operations, with 3-5 police plus Road Safety Officers (RSOs) involved. Responses have generally been positive, with no prosecutions. Motorcycles have occasionally been used. They take camera footage with tablets, for instant feedback to drivers. Not much has been done on social media. They are trying to extend the operation into winter by following existing cyclists to watch for close passes. A poorly trained cyclist seems to get a lot of close passes compared to better trained ones. The local authority is looking at the “Kaleidoscope” online reporting app, which is being developed. The police will promote it; if successful, it should be usable for prosecutions. ‘Space for Cyclists’ the Metropolitan Police Close Pass initiative was launched on the 21st July 2017. They posted throughout the event, and for the following week ’Space for Cyclists’ dominated our Twitter account, coining and repeatedly using the hashtags #WeCantBeEverywhereButCouldBeAnywhere and #SpaceForCyclists. At the end of that week they had seen a 5% increase in followers rising to 3363. Immediately after the launch In 4 days they visited 5 sites across London and stopped a total of 18 cars overall; all of these drivers were spoken to and given the presentation and all of them took the advice well and admitted that they had not been aware that they had passed too close nor of the potential dangers involved. They also engaged with cyclists at the sites. Although the primary importance behind this was not to issue drivers with tickets, two tickets issued for construction and use offences. 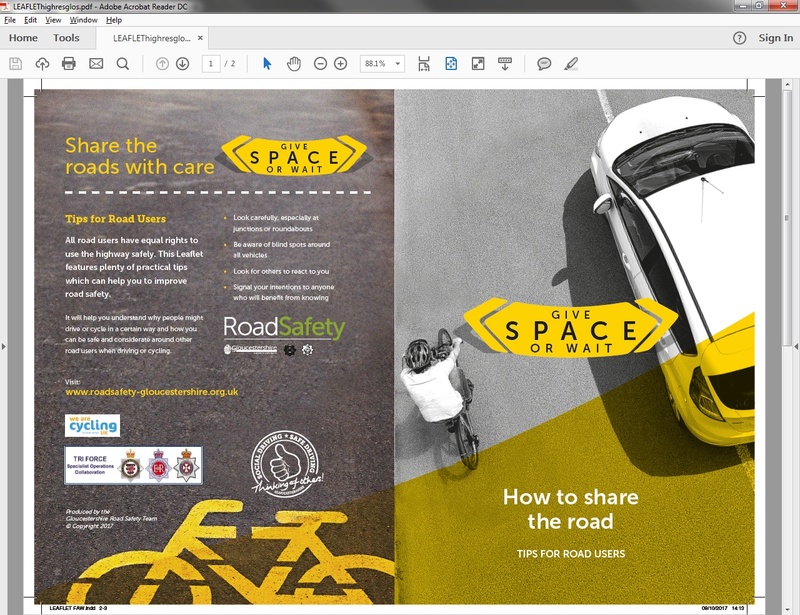 The ‘Space for Cyclists’ success was capitalised upon at Ride London: interaction with the public and handed out hundreds of ‘I Give Space for Cyclists’ car stickers which were created to help remove perceived pressure on the driver from cars that might be following them. Despite being a small unit, by using the tactic of having a plain clothed cyclist ideally with motorcycle support means they have been able to access outer London areas where the higher speeds have previously made cycle deployment ineffective which “gives us the appearance of being a larger and more far reaching unit than we really are”. This scheme was never intended to be short-term operation, but rather it is a tool in their toolbox . 4. officer trained to carry out vehicle examinations. They have used Community Support Officers on some operations to carry out checks and deliver the presentation and have run it with only 4 people, which they consider to be the minimum. They are also proposing to run some sessions with other partners, Fire Brigade and Ambulance Service. The initiative is carried out on any road suitable for cycle patrols (i.e. not fast roads) and it is ideal for use in outer London boroughs where regular patrols are less successful due to faster traffic speeds and the inability to follow on a bicycle. Currently, they tend to choose sites in response to suggestions on Twitter and emails. The deployments tend to last for 3 hours during which they may switch to a secondary target site nearby if little work needs to be done. A site where little needs to be done may involve 3 – 4 drivers being stopped, one with more of a problem some 15 – 20. In the first week of November CST were at road works on Waterloo Bridge advising cyclists to “take the lane” (primary position) to deter drivers from overtaking where unsafe to do so. Once they have been to a site, they take a photograph of the area and post it on Twitter along with where they have been and any particularly good results. This allows followers on Twitter to see that they have been to some of the areas that they have raised as a concern and to highlight that although they may not have seen them, they were there. They are trying to communicate to the motoring community that they could be tailgating a plain clothed Police cyclist in the hope that it will be enough to make them consider the manner of their driving and whether or not it is safe. They currently do this by Tweeting where they have been and what their results were along with the actual interaction with motorists. The main consideration of concern with this method is that their Twitter account is predominantly followed by cyclists who are already aware of Unsafe following (tailgating), Unsafe overtaking (close passes) and Unsafe turning (left or right turns across the cyclists’ path). This needs to be addressed as the target audience is motorists and Cycle Safety Team are aware that they need to find a way to reach more of them. This is something they are looking to develop, maybe using social media in some form. MPS have an acceptable reporting system on their website, but not all reports are acted on, though all add to intelligence. It is important to stress that this work occurs in tandem with other operations: “Operation Safeway” a high visibility presence at junctions (2 operations in 2nd week November); “Operation Cubo” for no 3rd party insurance (2 operations per month) and “Exchanging places” once a week. Operation launched in October . Norfolk and Suffolk had only piloted a single day in each force area, using 3 cyclists (PCSOs), 3 Motorcyclists and members of the local fire station and an RSO from the council. They had only recorded 4 close pass offences in Norfolk and 3 in Suffolk, but in debrief found that would be attributable to running the operation early in the morning and during rush hour, in places where the cyclists were the ones managing to overtake static cars! They were planning on running 2 more operations in Norfolk in October, on a smaller scale, but in the afternoons in the areas where statistics suggest an increased number of cyclists collisions. They were pleased that the education format taken from colleagues in West Mids worked well and will be the default format. Partner agencies are committed to work with them and continue to deliver the inputs. 3rd party reporting for cyclist videos is not yet established, and both Norfolk and Suffolk have only established their car dash-cam processes in the last 6 months, so waiting to see how that works out before looking to expand to cyclist footage. Should the debrief of the close pass pilots come back as positive from local force management, they may look to build this in to the plan for next year’s operation. Attended the September training day and have used the mat alone mainly in Harrogate. Wales has 4 mats. There had been no active operations by mid-September due to lack of resources but are likely to try again now. They used mats at the Royal Welsh Show and Police open days, with good results on social media. They have links to the fire service. There had been a close passing operation by mid-September. They have a mat, but hadn’t used it by mid-September but they were due to. 3rd party reporting infrastructure isn’t ready yet. They want to copy the MPS system. They would like to use the county’s sustainable transport funding to tackle close passing. There are complaints from cyclists on social media about alleged inaction. They have made videos, which are popular, and are authorised to use social media. They see social media as essential to get the message @SurreyRoadCops E Rota have been out & about enforcing drivers passing cyclists too close. Ensure you overtake with sufficient safe distance. Oct 26th . They work with Surrey. They have a mat. No close-passing operations by mid-September, though they are likely to do some. The mat has been offered for use at “exchanging places” events. They have an online reporting mechanism for close passes, with 214 reported since May. Capturing video is a problem, so drivers have been warned, not prosecuted. 30,000 letters sent out overall from this “operation crackdown” . The chief constable is keen on close pass operations due to a recent increase in fatalities. They are talking to the fire authorities. They have 200,000 Facebook followers, and attend 6 road safety groups. They hoped the September training day meeting will catalyse start of close passing operations in both counties. West Midlands started their ground breaking operation(s) a year ago and are still “market leaders”. 1. On CLOSE PASSING: about 250 vehicles have been stopped in some 16 deployments – about one every three weeks. In the last 6 months they have been partnered by West Midlands Fire Service, who now do the educational work. This allows the police to carry out operations with four officers (one cyclist, one safety officer generally on a motorcycle, with two stopping officers at the stop site). 2. With 3rd PARTY REPORTING, they have had some 350 – 400 reports. Almost all of these have drivers contacted with educational material, although 3 cases have gone to court and resulted in guilty verdicts under Section 3 of the 1988 Road Traffic Act. Other cases where there has been a refusal to nominate a driver are pursued. (a) 20 MPH POLICING. This occurs some 2 -3 times per week and in excess of 500 drivers have been stopped since July 2017. (b) POLICING CYCLING INFRASTRUCTURE. They are about to start policing careless driving with regard to Rule 178 of the Highway Code, namely breaking of rules with regard to Advanced Stop Lines, to reduce “left hooking” incidents. West Midlands accept most 3rd party reports, and the TP officer decides if prosecution is appropriate. They went live in May with 6 deployments. Only 6 drivers were stopped, probably because they picked a quiet time when drivers weren’t in a hurry. Accordingly they want to do more analysis before each deployment. They want to try 2-3 hours at peak time. They borrowed the West Midlands leaflet, bought a mat and were given another. They use the second mat at events. They work in partnership with local authorities and the fire service, who have funding to share. 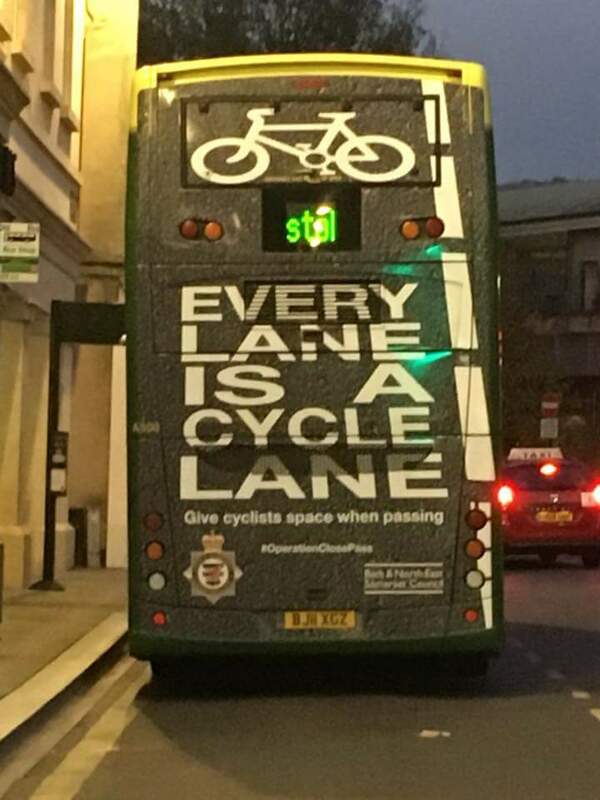 Their leaflet specifically says to leave more space when passing cyclists at higher speeds. Since the Tour de France visited the county, pelotons of cyclists on narrow roads in pretty areas have been an issue. They have done neighbourhood policing operations. One team has cyclists. They’ve made a check list for officers to follow. They give Section 59 warnings, which are recorded, so that repeat offenders can be detected. Education is done by local authority staff, but they will talk to the fire service. They want to roll this out throughout the county, and neighbourhood police are willing. They have to brief cyclists in these operations on how close is too close. They have VR, and have asked students to make videos. There is a Powerpoint briefing for police which includes the Chris Boardman video. PC Dominic Doyle was Highly Commended by Cycling Scotland for his work on “Operation Close Pass” and supported by Head of Road Policing, Chief Superintendent Stewart Carle, saying he had shown “great determination and innovation”. Seven pilot close-passing operations were run in Edinburgh between March and Summer 2017. 111 people were stopped. Social media reports of this got lots of views, and were picked up by broadcasters. They don’t use a mat with marked widths. 6-7 people run each operation: a cyclist, a motorcyclist, a stopper and educators. They “borrow” local officers, and do other enforcement while educators are occupied. They have run plenty of events. They have 3 mats, and will roll out operations throughout Scotland. They have more road deaths and serious injuries on Tues and Wed, so will target those days. Continued to run Op Close Pass activity in Edinburgh as well as events in the Fife and Forth Valley Divisions. Planning is ongoing in the West and North command areas of Scotland with activity anticipated to commence in 2018. They have no 3rd party incident reporting yet, though people can call 101. They have a ‘see a cyclist’ project, due to “SMIDSY” incidents. They have done pilot close passing operations, and more since. They got plenty of hits on social media for this. They provide camera graphics for cyclists to put on their jackets, and encourage cycling clubs etc. to get involved in social media campaigns. Their first close pass operation produced 15 stops. Subsequent operations had fewer due to social media publicity, but one driver was stopped 3 times. They have not prosecuted anyone. They find drivers behave better within sight of the police motorcyclist. They like the Cycling Uk mat. • Policing of close passing and related behaviours needs to be consistent and continuous. Doing very occasional operations to “tick the box” won’t work as the message won’t get out. It is very obvious that the forces making headway in this area have officers who are passionate about this kind of work. • 3rd party reporting is not only of critical importance but looks like being “the next big thing”. There are big changes involved and there will be a lot of pressure on officers to keep up with the technology. • A key element is road danger reduction (or “harm reduction”) which , although showing the link between close passing and KSIs, ir based on behaviours that don’t have to result ina collision occurring. • There is a need for continuing collection and dissemination of information. RDRF will be continuing this secretariat function and there was general agreement that we should have another training day/update on progress in early 2018. Finally, if as a member of the public you want your local Police Service to initiate this kind of work, do contact your Police and Crime Commissioner.